You and your family deserve the best, so travel in the 2019 Highland Ridge Mesa Ridge Lite MR2504BH! 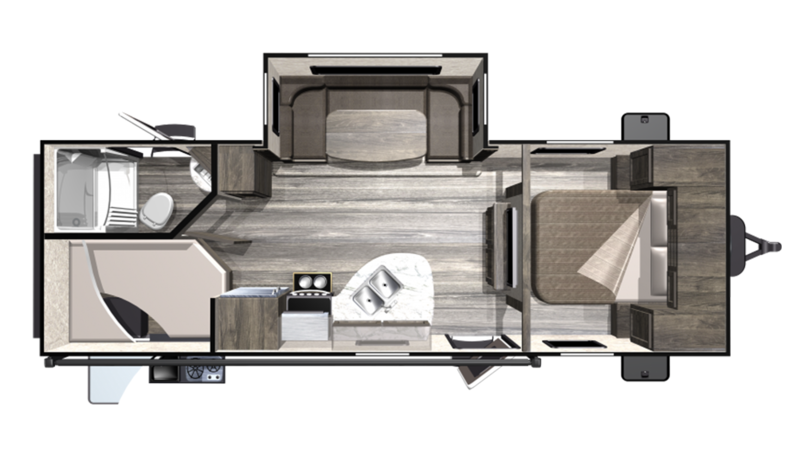 This beautiful Travel Trailer takes camping to the next level with supreme comfort and great amenities! Come on down to Tradewinds RV Center and talk to one of our friendly, knowledgeable RV experts. They'll be happy to show you how you can bring this model home at an unbelievable price! See us at 4325 W Vienna Rd Clio Michigan 48420. Don't live in or near Clio? Don't worry, you can pick out the RV you've always wanted online and give us a call at 810-686-0710! We'll save you $1000s and ship it to you with our fast, reliable, 24/7 store-to-door delivery service! You'll be on the road in your dream RV in no time! Take to the road and venture across the country without any issues! This RV has a hitch weight of 592 lbs. and GVWR of 7400 lbs. You'll want to place your camping chairs and picnic table next to the camper, as the 18' 0" awning will give you shade and protection from the elements! Do you have struggles sleeping when you're away from home? The Queen bed in the master bedroom will help you drift off to dreamland with ease! There are enough comfy sleeping accommodations to give 8 people a good night's rest! Make tasty breakfasts, delightful lunches, and delicious dinners in the kitchen, which features a 3 burner range cooktop and 8.00 cu. ft. refrigerator. Everyone can enjoy clean drinking water from the 51 gallon fresh water tank. One of the nicest amenities in the Highland Ridge Mesa Ridge Lite MR2504BH is the beautiful bathroom! It has a modern shower and a sanitary, easy to use Porcelain Foot Flush commode. The big 51 gallon freshwater tank and 60 lbs. of LP tank capacity mean plenty of hot water for everyone! The 29 gallon gray water tank and the 29 gallon black water tank provide ample, convenient storage space for used water and waste. Restless children are the bane of vacation, so make sure that your kids can sleep easily! Thankfully, this comfy camper has a private bunkhouse! Cold drinks, tasty snacks, and hot meals can all be whipped up in the fresh air with the outdoor kitchen!